The question of whether Scotland should have nuclear weapons has caused the first major row of the 2015 General Election campaign. It’s seen MP Gregg McClymont blasted by Scottish Nationalist prospective Parliamentary candidate Scottish Nationalist Stuart McDonald . Because he claims that the Labour man is just like the Conservatives - and has got form for it. 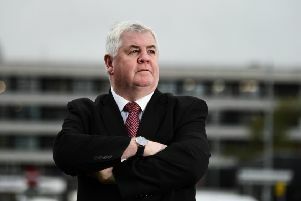 Milton of Campsie native and charity worker Mr McDonald said: “Increasingly, on many of the key issues it looks like there is little difference between Labour and the Tories. “That the local Labour MP has backed George Osborne’s latest proposals for austerity cuts and now has aso signed up to spending billions on new nuclear weapons will stick in the craw of many people who have been sympathetic to the party in the past. “We know from local canvassing and national polling that more and more people are switching away from Labour to the SNP. With the SNP, people know they will get representatives that stand up for Scotland – against Tory cuts, and against nuclear weapons”. However, an angry Mr McClymont said that Mr McDonald was not in full grasp of the facts as he is opposed to this form of warfare. He said: “I want to see a world free of nuclear weapons. That is why I am pleased that the Labour Party recognises the importance of Britain leading international efforts for multilateral nuclear disarmament and non-proliferation. “The last Labour Government was the first Government of a nuclear power to call for an end to nuclear weapons while in office. “However, in a world where others still possess nuclear weapons and the future security landscape remains uncertain, unilaterally abandoning the nuclear deterrent will not make Britain or the world more secure. “The only way to end the nuclear threat for good is through international dialogue as that great socialist Aneurin Bevan famously insisted when he backed multilateral nuclear disarmament. “Simply moving nuclear weapons such that they are stationed closer to Dumfries than Loch Lomond is not a solution, added Mr McClymont. The General Election will take place on Thursday, May 7. Mr McClymont has served one term at Westminster after being elected with a 13,755 majority which represented 75 per cent of the vote - but the Scottish Nationalists say that they are confident of victory.